LOCATION.--Lat 40`56'35", long 77`47'12", Centre County, Hydrologic Unit 02050204, on right bank 130 ft downstream from bridge on State Highway 144 at Milesburg, and 250 ft downstream from Spring Creek. PERIOD OF RECORD.--October 1955 to current year. Prior to October 1967, published as North Bald Eagle Creek below Spring Creek at Milesburg. GAGE.--Water-stage recorder and crest-stage gage. Datum of gage is 682.49 ft above National Geodetic Vertical Datum of 1929. 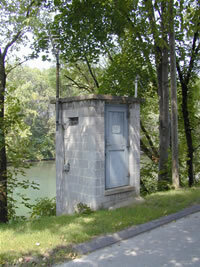 Prior to Aug. 31, 1956, non-recording gage at site 130 ft upstream at same datum.